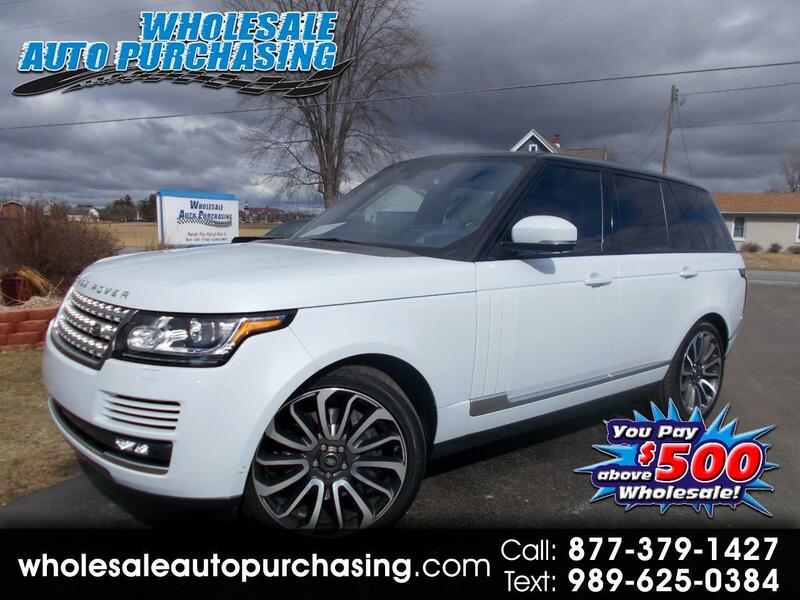 2016 LAND ROVER RANGE ROVER SUPERCHARGED AWD PEARL BABY RIDE-N-STYLE!!! Just in today is this 2016 Land Rover Range Rover AWD (All Wheel Drive)!!! 5.0L V8 Supercharged Engine With Automatic 8-Speed Transmission!!! Gorgeous Bright White Metallic Exterior!!! Genuine Cashmere Heated N Cooled Leather Interior!!!! Fully Loaded Including Navigation, Panoramic Moonroof, Backup Camera, Premium Stereo, Premium Wheels!! Gorgeous Inside and Out!!!! JUST A TRUE EXAMPLE OF LUXURY AT ITS FINEST!!!! Awesome SUV!! SAVE THOUSANDS buying from us. Just serviced and is a local clean car fax non smoker!! Good luck finding one this nice at this price!! Call Now because it will go quick! MSRP was $115k new. We have the best price guaranteed. Why? Because we are WHOLESALE AUTO PURCHASING, NEVER PAY RETAIL AGAIN!! !, Don't pay Retail Buy WHOLESALE!! $500.00 above wholesale - Call 1-877-379-1427 to set up a viewing and a test drive. Thank you for considering Wholesale Auto Purchasing in Frankenmuth, MI for your next vehicle purchase. We Currently Offer Financing Rates as low as 1.9% Call 1-877-379-1427 to set up a viewing and a test drive! !